“I wondered where that was!” During every major decluttering effort, it seems I hear those words at least once. And that’s why I sometimes remind clients that we’re going on a treasure hunt. We’ve found passports, precious family photos, $800 in traveler’s checks, and so much more. Sometimes the “treasure” is less tangible. Those treasures can range from finding the space to welcome a new baby to creating an uncluttered, inspiring office for someone to do her best work. And sometimes the treasure is just the peace of mind that comes from knowing that we’re ready for whatever life throws at us — because we can find things, our papers are in order, our schedules under control. Since decluttering and organizing are ongoing efforts, I thought I’d share some of what I’m working on in my own home (and home office). As I noted in a recent blog post, I’ve been going through my files of travel information, and finding much I don’t need to keep. But I’ve also been clearing out some on my financial files. Some of this was the annual maintenance of discarding one more year of old tax records, for both myself and my mom. But there were plenty of other papers, too. I definitely wanted to keep my latest Social Security statement showing my projected income when I start claiming those benefits. But I sure didn’t need that information in paper form! I scratched out my social security number, scanned the paper, and shredded the original. Other papers I just didn’t need at all. I had a nice file called Utilities which included, among other things, a couple brochures about the new SmartMeters the gas and electric company installed recently. If I ever want this information — and I’m not sure why I ever would — I can find it online just fine.The file also had a note about the numbers to call if I ever lose my power; the numbers belonged in my address book, so I added them there. Many papers from that one file that wound up in my recycling bin! Similarly, I didn’t need envelopes for donating to charities when I now make those donations online. And my public radio stations have their calendars online; I don’t need those in paper form, either. I’ve got more files to go through, but I’m really pleased with my progress. I’d like each file drawer to be no more than 75-80% full, since that makes filing easier — and I’m getting close. 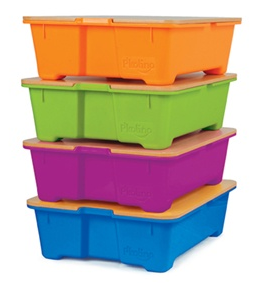 Thanks to The Shelving Store for pointing me to some fun storage bins: the P’Kolino Play Kits. They’re designed to work with other P’Kolino products, or on their own, and could store all sorts of stuff.